Be the first to share your favorite memory, photo or story of Tina . This memorial page is dedicated for family, friends and future generations to celebrate the life of their loved one. 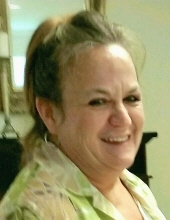 Mrs. Tina Gail Heath Millican, age 54, of Cedartown, GA passed away Wednesday, November 22, 2017. She was born in Atlanta, GA on October 30, 1963, daughter of Tommy Heath and Carolyn Welchel Heath. Mrs. Millican lived the greater part of her life in Cedartown. She was a graduate of Cedartown High School Class of 1982. She is preceded in death by her father, Tommy Heath; husband, Scott Millican and sister, Connie Heath. Survivors include her sons: Chad Millican and Dakota Millican; step-daughter, April Smith; granddaughter, Kynlei Millican; mother, Carolyn Heath; brothers: Brian Heath, William Heath and Vince Heath; several nieces, nephews and cousins also survive. Memorial services to celebrate Tina’s life will be held Monday, November 27, 2017 at 1:00 PM at Pine Bower Baptist Church with Rev. Roger Kiser officiating. The family will receive friends Monday afternoon from 12:30 PM until 1:00 PM in the sanctuary of Pine Bower Baptist Church. The Smith & Miller Funeral Home of Cedartown is honored to serve the family of Mrs. Tina Millican. To send flowers or a remembrance gift to the family of Tina Gail Heath Millican, please visit our Tribute Store. "Email Address" would like to share the life celebration of Tina Gail Heath Millican. Click on the "link" to go to share a favorite memory or leave a condolence message for the family.